The Meuse-Argonne Offensive, also called the Battle of the Argonne Forest, was a part of the final Allied offensive of World War I that stretched along the entire western front. The whole offensive was planned by Marshal Ferdinand Foch to breach the Hindenburg line and ultimately force the opposing German forces to capitulate. The big September/October Allied breakthroughs (north, centre and south) across the length of the Hindenburg Line - including the Battle of the Argonne Forest - are now lumped together as part of what is generally remembered as the Grand Offensive (also known as the Hundred Days Offensive) by the Allies on the Western front. The Meuse-Argonne offensive also involved troops from France, while France, Britain and its dominion and imperial armies (mainly Canada, Australia and New Zealand), and Belgium contributed to major battles in other sectors across the whole front. The French and British armies' ability to fight unbroken over the whole four years of the war in what amounted to a bloody stalemate is credited by some historians with breaking the spirit of the German Army on the Western Front. The Grand Offensive, including British, French and Belgian advances in the north along with the French-American advances around the Argonne forest, is in turn credited for leading directly to the Armistice on November 11. On September 26, the Americans began their strike towards Sedan in the south; British and Belgian divisions drove towards Ghent (Belgium) on the 27th, and then British and French armies attacked across northern France on the 28th. The scale of the overall offensive, bolstered by the fresh and eager but largely untried and inexperienced U.S. troops, signaled renewed vigor among the Allies and sharply dimmed German hopes for victory. The Meuse-Argonne offensive, shared by the U.S. forces with the French 4th Army on the left (as shown on the accompanying map and armistice), was the biggest operation and victory of the American Expeditionary Force (AEF) in World War I. The bulk of the AEF had not gone into action until 1918. The Meuse-Argonne battle was the largest frontline commitment of troops by the U.S. Army in World War I, and also its deadliest. Command was coordinated, with some U.S. troops (e.g. the Buffalo Soldiers of the 92nd Infantry Division (United States) and the 93rd Infantry Division (United States)) attached and serving under French command (e.g. XVII Corps during the second phase). 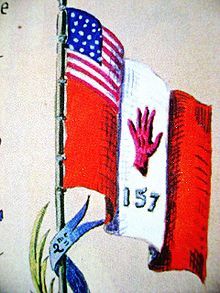 Picture - 157th I.D.Red Hand flag  drawn by General Mariano Goybet. On September 28, the French General Mariano Goybet commanding the 157 Red Hand Division sent his troops in the Meuse-Argonne Offensive. He broke with his troops the front face Monthois. Two of his regiments were African Americans : 371 and 372 detached from the 93rd Infantry Division (United States). In their first nine days of fighting in the Meuse-Argonne sector, the 372nd can be credited with progressing through 4.8 miles of heavily organized defenses. In the process they took 600 enemy prisoners, captured 15 heavy guns, 20 Minenwerfers, and approximately 150 machine guns, as well as securing an enormous quantity of engineering supplies and artillery ammo. The 372nd played a key role in the Meuse-Argonne Offensive and suffered casualties of 500 men killed, wounded, or gassed in action. They fought gallantly at Verdun, Bussy Farm (where all officers of Co. I were either killed or wounded), and Sechault to name a few of their accomplishments.The regiment was then taken out of the line and thrown into the great September 1918 offensive in the Champagne. The 371�me regiment in the Meuse-Argonne Offensive took Cx�te 188 , Bussy Ferme, Ardeuil, Montfauxelles, and Trieres Ferme near Monthois. The regiment captured many German prisoners, 47 machine guns, 8 trench engines, three 77mm. field pieces, a munitions depot, many railroad cars, and enormous quantities of lumber, hay and other supplies. It shot down three German airplanes by rifle and machine-gun fire during the advance. During the fighting between 28 September and 6 October 1918 its losses, which were mostly in the first three days, were 1,065 out of 2,384 actually engaged. Corporal Freddie Stowers distinguished himself in the assault on the Cx�te 188, near Bussy Farm. The main U.S. effort of the Meuse-Argonne offensive took place in the Verdun Sector, immediately north and northwest of the town of Verdun, between 26 September and 11 November 1918. Of the battles that constituted the Grand Offensive, this is the one best remembered in the U.S. 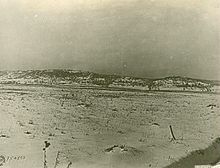 However, even from a U.S.-centric perspective, another interesting feature of the Grand Offensive was that in one sector far to the north, U.S. troops of the 27th and 30th divisions of the II Corps AEF fought under British command in a spearhead attack on the Hindenburg Line with 12 British and Australian divisions - and directly alongside the exhausted veteran divisions of the Australian Corps of the First Australian Imperial Force (1st AIF). With artillery and British tanks, the combined three-nation force, despite some early setbacks, attacked and captured their objectives (including Montbrehain village) along a six-kilometre section of the Line between Bellicourt and Vendhuille, which was centred around an underground section of the St Quentin Canal and came to be known as the Battle of St. Quentin Canal. Of the two battles involving U.S. troops in the Grand Offensive, this was the more immediately significant in terms of the overall result of the offensive and thus the ending of the conflict as the capture of the heights above the Beaurevoir Line by October 10 marked a complete breach in the Hindenburg Line. That was precisely the goal of the overall offensive as masterminded by Marshal Foch. The victory at the Battle of St. Quentin Canal seems largely forgotten in the U.S., despite the American input, probably because unlike at St. Quentin, a distinct part of the Meuse-Argonne frontline (to the right of the French) was all-American. The American forces consisted initially of fifteen divisions of the U.S. First Army commanded by General John J. Pershing until October 16 and then by Lt. General Hunter Liggett. The logistics were planned and directed by Col. George Marshall. The French forces next to them consisted of 31 divisions including the 4th Army (under Henri Gouraud) and the 5th Army (under Henri Mathias Berthelot). The U.S. divisions of the AEF were oversized (16 battalions per division verse the French/British/German 9 battalions per division), being up to twice the size of other Allies' battle-depleted divisions upon arrival, but the French and other Allied divisions had been partly replenished prior to the Grand Offensive, so both the U.S. and French contributions in troops were considerable. Most of the heavy equipment (tanks, artillery, aircraft) was provided by the European Allies. For the Meuse-Argonne front alone, this represented 2,780 artillery pieces, 380 tanks and 840 planes. As the battle progressed, both the Americans and the French brought in reinforcements. Eventually, 22 American divisions would participate in the battle at one time or another, representing two full field armies. Other French forces involved included the 2nd Colonial Corps, under Henri Edouard Claudel, which had also fought alongside the AEF at the Battle of Saint-Mihiel earlier in September 1918. The opposing forces were wholly German. During this period of the war, German divisions procured only 50 percent or less of their initial strength. The 117th Division, which opposed the U.S. 79th Division during the offensive's first phase, had only 3,300 men in its ranks. Morale varied among German units. For example, divisions that served on the Eastern front would have high morale, while conversely divisions that that were just on the western front had poor morale. Resistance grew to approximately 200,000 German troops from the Fifth Army of Group Gallwitz commanded by General Georg von der Marwitz. The Americans estimated that they opposed parts of 44 German Divisions overall, though many fewer at any one time. The objective was the capture of the railroad/train station hub at Sedan which would break the rail net supporting the German Army in France and Flanders. Picture - Ruined church at Montfaucon-d'Argonne. The blocky structure on the left is a German WWI observation post. The American attack began at 5:30 a.m. on September 26 with mixed results. The V and III Corps met most of their objectives, but the 79th Division failed to capture Montfaucon, the 28th "Keystone" Division was virtually ground to a halt by formidable German resistance, and the 91st "Wild West" Division was compelled to evacuate the village of x�pinonville though it advanced eight kilometers. The green 37th "Buckeye" Division failed to capture Montfaucon d'Argonne. The subsequent day, September 27 most of 1st Army failed to make any gains. The 79th Division finally captured Montfaucon and the 35th "Sante Fe" Division captured the village of Baulny, Hill 218, and Charpentry, placing the division forward of adjacent units. On September 29, six extra German divisions were deployed to oppose the American attack, with the 5th Guards and 52nd Division counterattacking the 35th Division, which had run out of food and ammunition during the attack. The Germans initially made significant gains but were barely repulsed by the 35th Division's 110th Engineers, 128th Machine Gun Battalion and Harry Truman's Battery D, 129th Field Artillery. In the words of General Pershing, "We were no longer engaged in a maneuver for the pinching out of a salient, but were necessarily committed, generally speaking, to a direct frontal attack against strong, hostile positions fully manned by a determined enemy." The German counterattack had shattered so much of the 35th Division, a poorly led division (most of its key leaders were replaced shortly before the attack) made up of National Guard units from Missouri and Kansas, that it had to be relieved early - though remnants of the division subsequently reentered the battle. Part of the adjacent French attack met temporary confusion when one of its generals died, however it was able to advance nine miles, penetrating deeply into the German lines, especially around Somme-Py (the Battle of Somme-Py (French: Bataille de Somme-Py)) and northwest of Reims (the Battle of Saint-Thierry (French: Bataille de Saint-Theirry)). The initial progress of the French forces was thus faster than the two to five miles gained by the adjacent American units (however, the French units were fighting in a more open terrain, which is easier to attack). Picture - A German Hannover CL III shot down on October 4 between Montfaucon and Cierges. The second phase of the battle began on 4 October, during which time all of the original phase one assault divisions (the 91st, 79th, 37th and 35th) of the U.S. V Corps were replaced by the 32nd, 3rd and 1st Divisions. The 1st Division created a gap in the lines when it advanced one and a half miles against the 37th, 52nd, and 5th Guards Divisions. It was during this phase that the Lost Battalion affair occurred. The battalion was rescued due to an attack by the 28th and 82nd Divisions (the 82nd attacking soon after taking up its positions in the gap between the 28th and 1st Divisions) on October 7. The Americans launched a series of costly frontal assaults that finally broke through the main German defences (the Kriemhilde Stellung of the Hindenburg Line) between 14-17 October (the Battle of Montfaucon (French: Bataille de Montfaucon)). By the end of October, US troops had advanced ten miles and had finally cleared the Argonne Forest. On their left the French had advanced twenty miles, reaching the Aisne River. It was during the opening of this operation, on October 8, that Corporal (later Sergeant) Alvin York made his famous capture of 132 German prisoners. Picture - 328th Infantry Regiment of 82nd Airborne Division line of advance in capture of Hill 223 on October 7, 1918. By October 31 the Americans had advanced fifteen kilometers and had finally cleared the Argonne Forest. On their left the French had advanced thirty kilometers, reaching the River Aisne. The American forces reorganized into two armies. The First, led by General Ligett, would continue to move to the Carignan-Sedan-Mezieres Railroad. The Second Army, led by Lieutenant General Robert L. Bullard, was directed to move eastward towards Metz. The two U.S. armies faced portions of 31 German divisions during this phase. The American troops captured German defenses at Buzancy, allowing French troops to cross the River Aisne, whence they rushed forward, capturing Le Chesne (the Battle of Chesne (French: Bataille du Chesne)). In the final days, the French forces conquered the immediate objective, Sedan and its critical railroad hub (the Advance to the Meuse (French: Pouss�e vers la Meuse)), on November 6 and American forces captured surrounding hills. Although the Meuse-Argonne was "probably the bloodiest single battle in U.S. history," in the sense that it had the largest number of U.S. dead in a single battle, it is little remembered today in the United States. Its battleground memorials are neglected by most American visitors to Europe, though Europeans pay more attention to them and other World War I battlegrounds and memorials. The battle also hailed the debut of the Browning Automatic Rifle in combat, with both the US and France using them significantly for the first time in battle. According to the American view, the battle's pressure on the Germans was an important factor in their agreeing to the armistice: "Until the last, this battle had worried German commanders most; unlike other sectors of the front, here they had little space short of a vital objective that they could afford to trade for time." Many historians have since begun to debate the legitimacy of this claim, with many believing that the Meuse-Argonne offensive was simply a diversion from greater Allied offensives and successes elsewhere. Lengel, Edward G. (2008). To Conquer Hell. New York: Henry Holt. ISBN 0805079319.